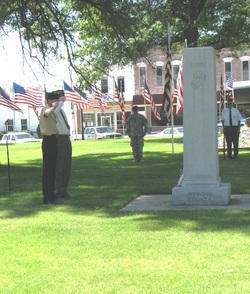 Johnson County Avenue of Flags was established October 30, 1985 as a Memorial to the deceased Veterans of Johnson County who had served on active duty in the Armed Services of the United States. A committee of representatives from the five American Legion Posts and the Veterans of Foreign Wars of Johnson County administer the Memorial. Any Veteran with legitimate ties to Johnson County are eligible for honor in the Memorial. The Memorial Flags are displayed on Sunday and Monday of the Memorial Day weekend, on July 4th Holiday and on Veterans Day. Capacity of the Memorial is 559 flags. For those who did not reserve space at the Courtyard, flags are being accepted for display on the "Wall of Honor" located at the new Veterans Club, 255 Clay Street. For information on display of flags for deceased Veterans, or to make contributions for operation and upkeep of the Memorial, call 402-335-3275 or write to Avenue of Flags, P.O. Box 581, Tecumseh, NE 68450.